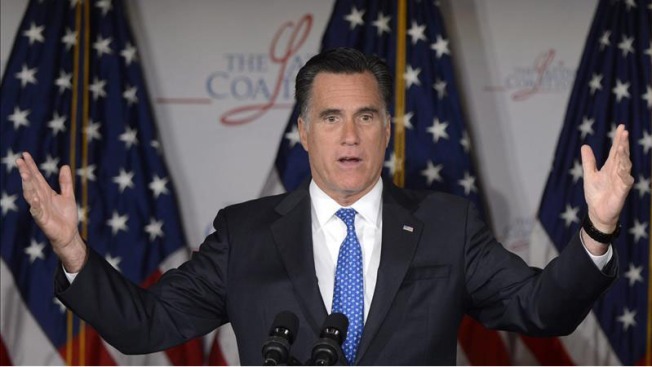 Romney to Help Raise Money for Comstock in Va.
Former GOP presidential nominee Mitt Romney is coming to northern Virginia to help an old ally in her congressional campaign. Romney is headlining a fundraiser Tuesday night in McLean for Barbara Comstock, who served as his Virginia campaign co-chair in 2012 and was one of his more prominent surrogates in that race. Comstock, a Republican, is running against Democrat John Foust in Virginia's 10th District, which stretches from McLean neighborhoods inside the Capital Beltway west to the Shenandoah Valley. The longtime incumbent in the district, Frank Wolf, is retiring after more than 30 years in office. The race has been one of the most closely watched in the nation, featuring an open seat in a district that has supported Republicans and Democrats. The fundraiser will be closed to the press.